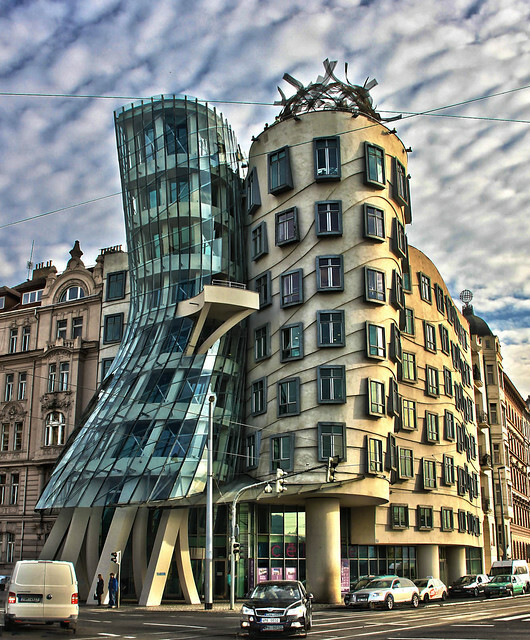 [Oct. 8, 2013] Obligatory HDR photo of one of the Dancing House, Prague’s weirdest building. It was originally named Fred and Ginger, after Fred Astaire and Ginger Rogers. I think it looks like a Dalek trying to camouflage itself as an apartment building. Lots of people have done far better HDR images of this building, but I thought I’d give it a try. Handheld, processed with Adobe Photoshop CS6. 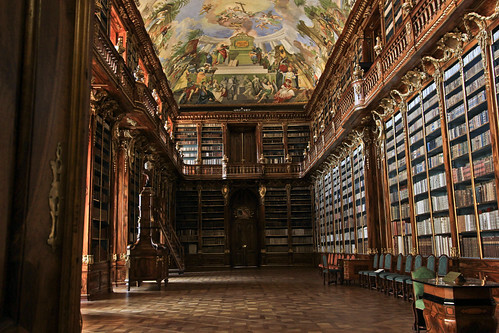 Back to Prague, and from the sublime to the ridiculous…. 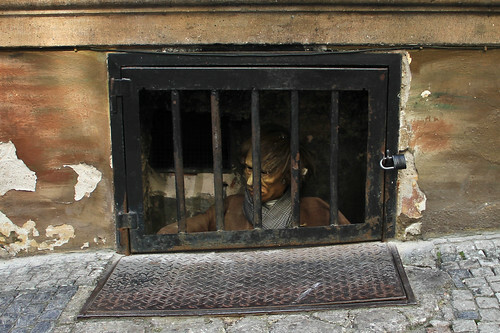 In addition to the State Opera and stunning Gothic architecture, Prague has a silly theme park side. 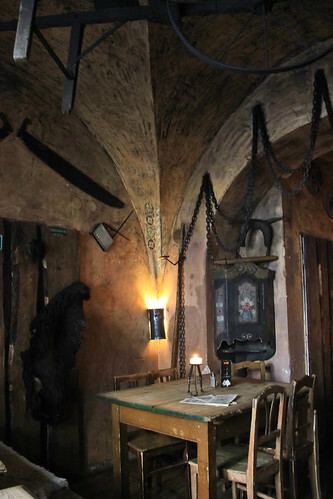 Středověká krčma (literally “Medieval Tavern”) was very quiet when I visited it on Sunday morning. If you show up during the evening the web site advertises swordsmanship and “medieval” dancing (scroll down to the video of scantily clad fire dancers). 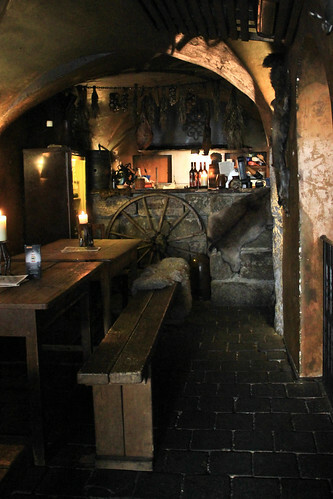 I have no idea whether this tavern is really medieval. 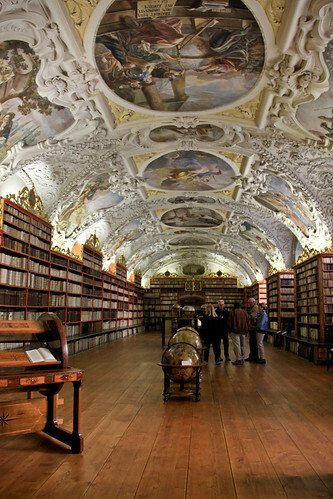 It has generally good reviews on Trip Advisor, but don’t expect the Prague State Opera. I wandered inside for about 3 minutes and took these photos at very high ISO because it was so dark. 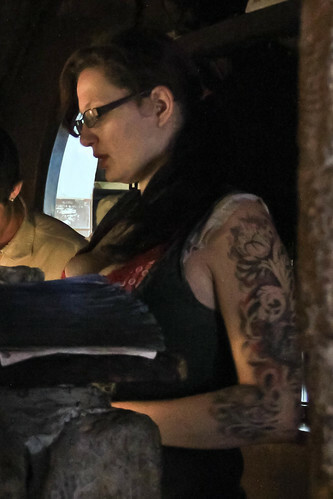 I wish I had managed to get a better photo of this waitress. She was amazing. 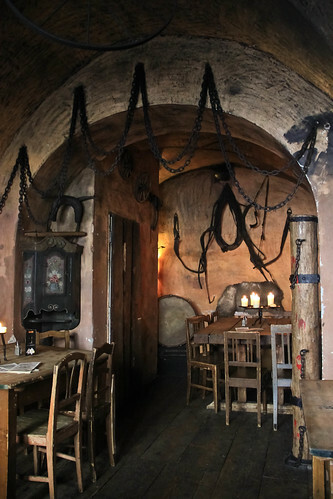 The decor is Neo-Torture Chamber. I think they used the same interior designer as the Red Keep. 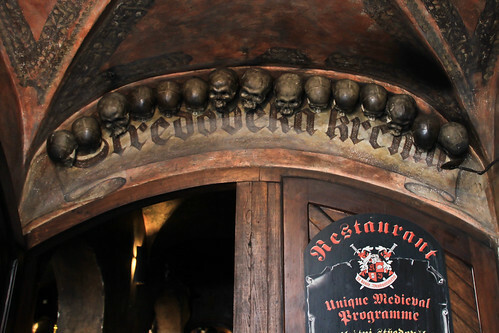 The room with the skulls in the ceiling is downstairs (I missed that somehow). 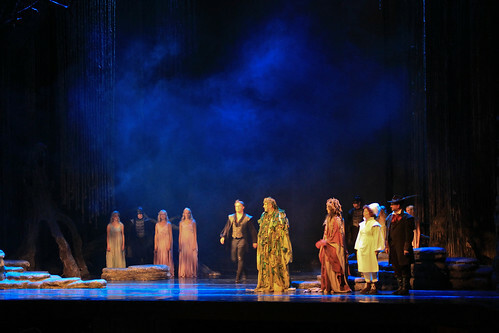 Dvořák’s lyric opera, Rusalka, was first performed in 1901. 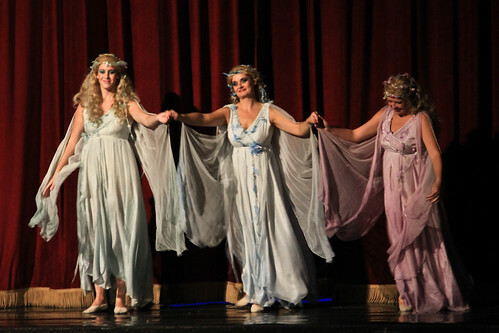 It remains one of the most popular Czech operas. 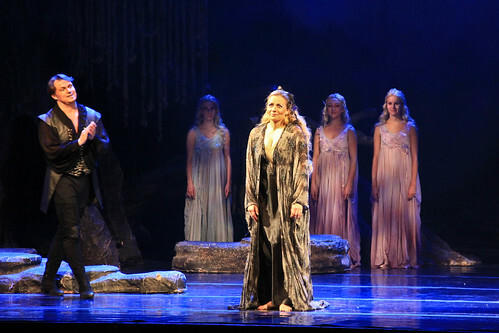 (A rusalka is a water nymph or sprite who lives in a stream.) 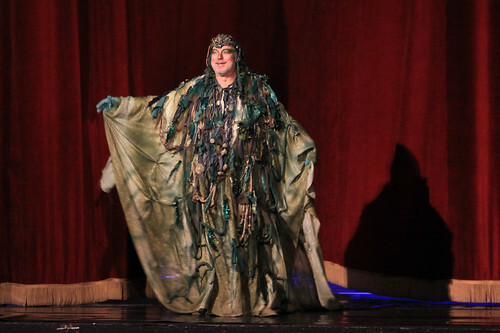 The heroine of this opera, Rusalka, is a water nymph who falls in love with a human prince and gives up her voice in return for being able to live on land as a mortal. 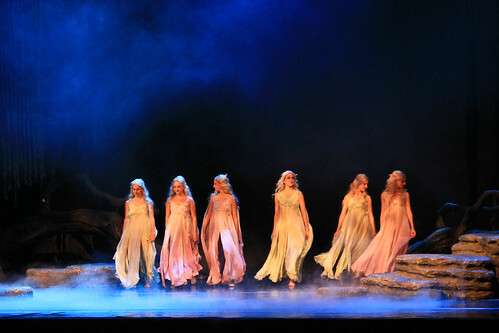 Rusalks is the original Slavic “Little Mermaid,” which was adapted by Hans Christian Anderson. 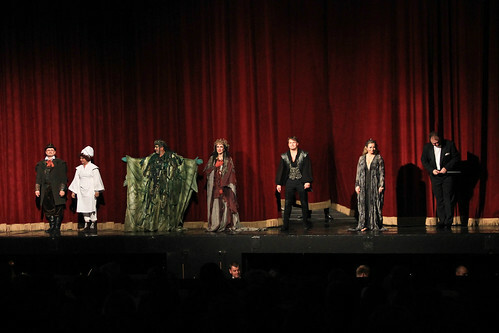 Disney gave the story a happy ending, but since this is opera, everyone dies at the end. 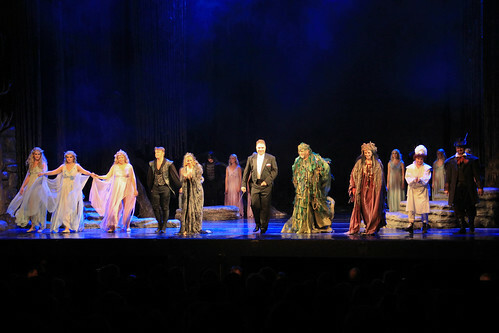 The production was gorgeous and the voices were wonderful. I didn’t want to be too obvious about taking photos (we were sharing the box with a German couple), so most of these photos were taken during curtain calls. 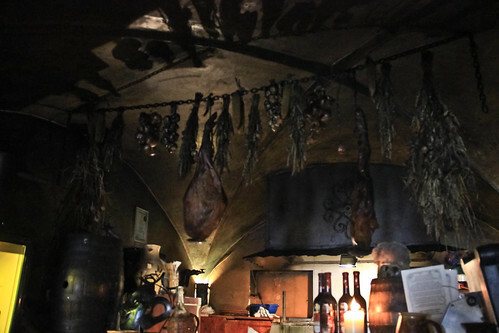 The first photo (above) shows the castle where they are preparing for the wedding feast. It was such a stunning set I had to photograph it. The curtain calls with the red curtain in the background were taken just before the intermission. The opera is three hours long. 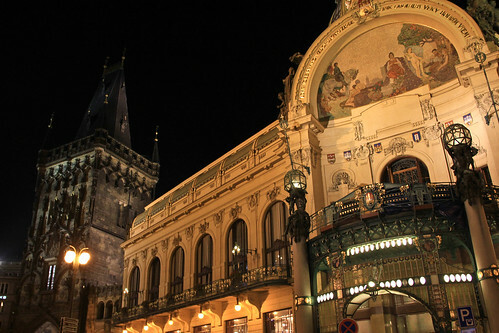 I found a video of short segments from this production, uploaded by the Prague State Opera. It’s a pity that the famous “Song to the Moon” is so difficult to hear over the orchestra, but the rest of the excerpts are quite good. It’s a pity that the dance segments were not included, because the wedding dance was impressive. 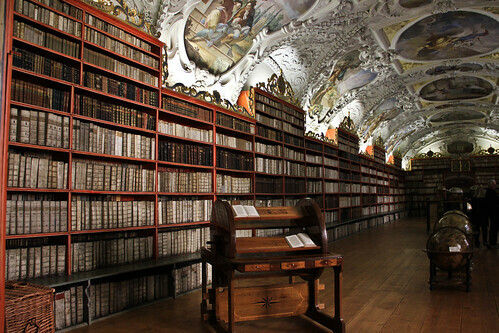 It’s been a while since I’ve posted photos of Prague. 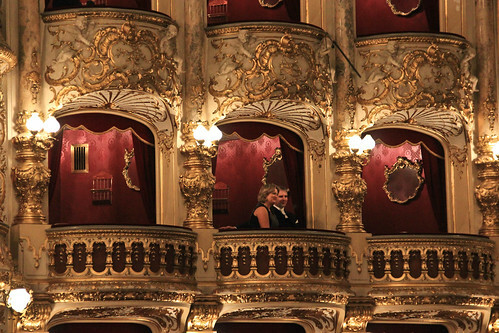 This is the Prague State Opera. 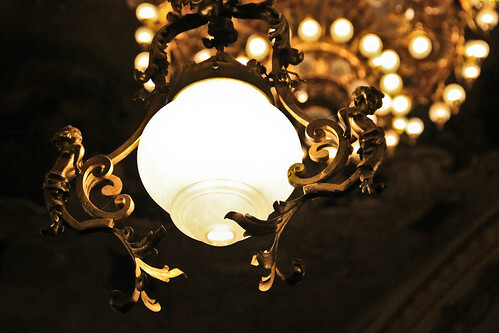 I’ve always wanted to watch an opera in an old European opera house–one of those Baroque chocolate boxes with gilded balconies and chandeliers, and champagne at intermission. 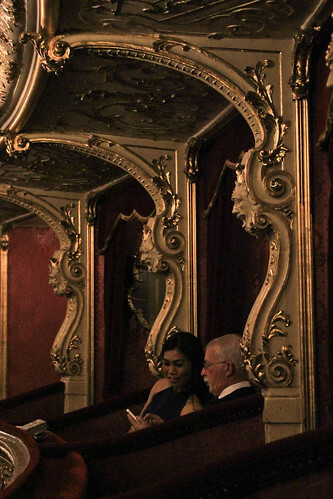 The Prague State Opera was perfect, and very reasonably priced (most expensive tickets were around $50, much less than you’d pay at La Scala or Covent Garden). You can buy tickets on-line. 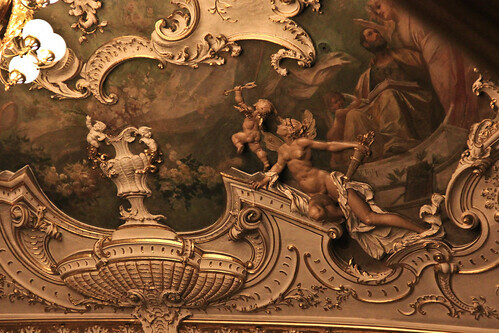 We watched Dvorak’s opera, “Rusalka.” Most of these photos were taken during the intermission. I didn’t want to be too obvious with the camera, so I didn’t bring a wide angle lens with me. The photos don’t do it justice. 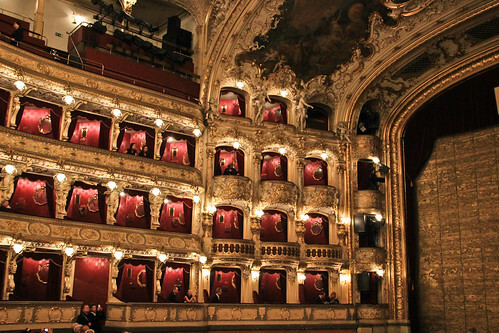 The State Opera is considered one of the most beautiful opera houses in Europe. 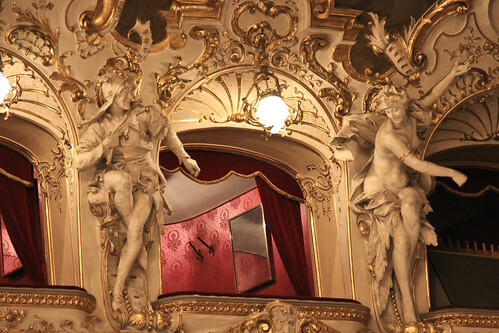 The Prague State Opera. 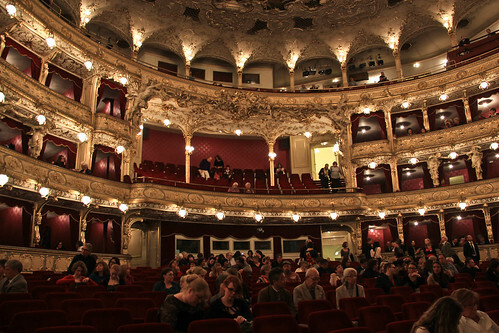 originally called the New German Theater, opened in 1888. 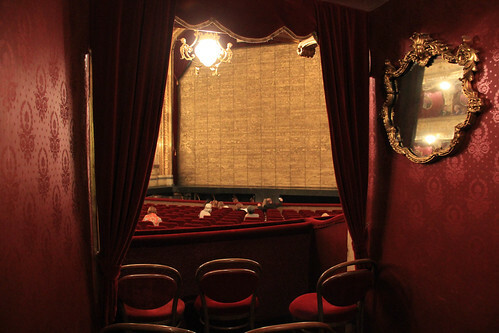 From 1949 to 1989, it was called the Smetana Theater. 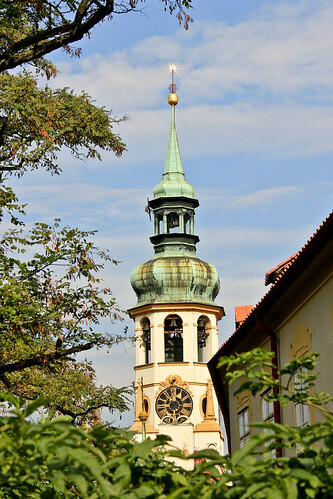 It was originally built by the German-speaking community in Prague, when Prague was part of the Austro-Hungarian empire. 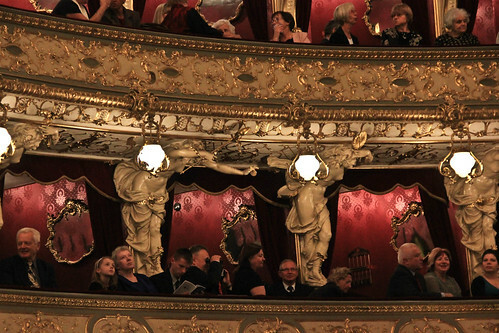 Opera is very popular among the Czechs. 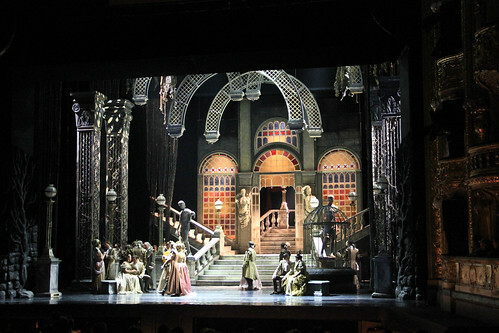 While the concerts in chapels tend to be specifically for tourists (i.e., 45 minutes of Great Baroque Hits, played by competent but not outstanding musicians), opera attracts a lot of the locals. If you’re planning to go, dress up a bit. I didn’t get a great shot of the facade because I would have had to cross a very busy street, several lanes wide. By the time the opera was over, it was dark, so I just took this quick snapshot from the sidewalk in front. 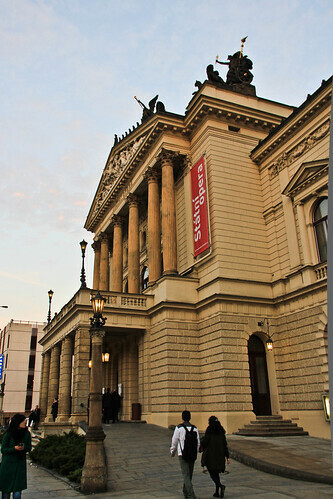 The State Opera is half a block from Wencelas Square, in the direction of the train station. Here’s the the view from inside our box. Ironically, the tiny wooden seats in the box seem to be less comfortable than the padded seats in the orchestra. There are a few advantages to having a box. You don’t have to check your coat because there are coat hooks on the wall. It’s easier to get out at the end of the performance. If you’re in a ground floor box, you’re close to the bathrooms. 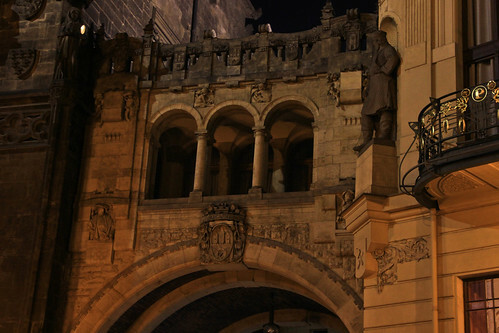 The boxes on the third level (below) have statues holding lamps. The boxes on either side of the stage are bowed. 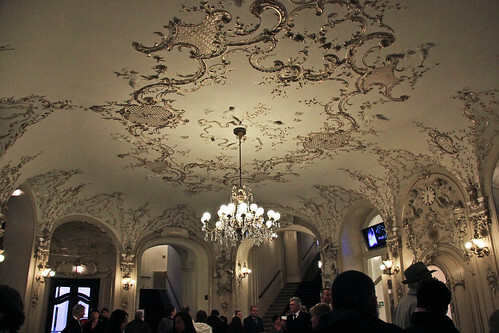 The lobby is much smaller, with rococo ceiling mouldings. 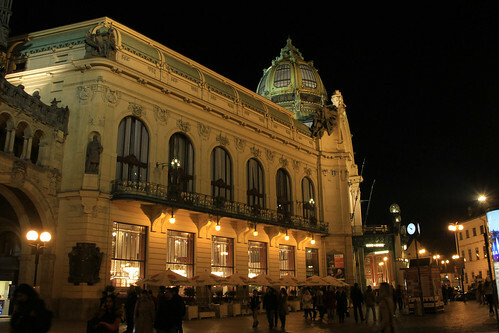 The Municipal House is a government building and concert hall, which was started in 1905 on the site of Royal Court palace (abandoned in the 15th century). 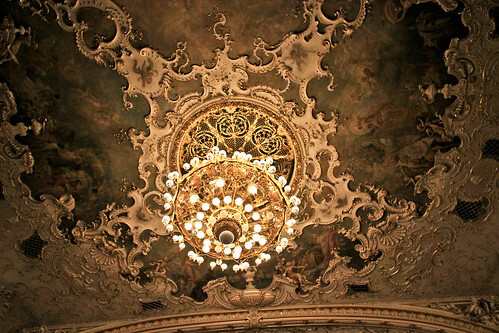 It is an extremely ornate Art Nouveau building, which is worth photographing inside. 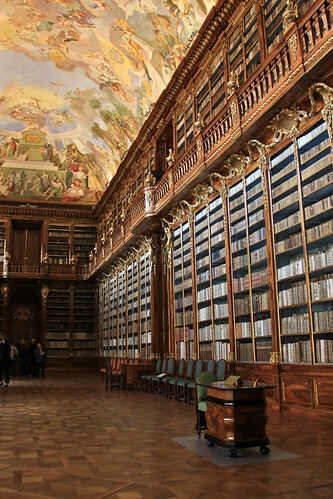 Many of the rooms are closed to the public but there are guided tours almost every day. 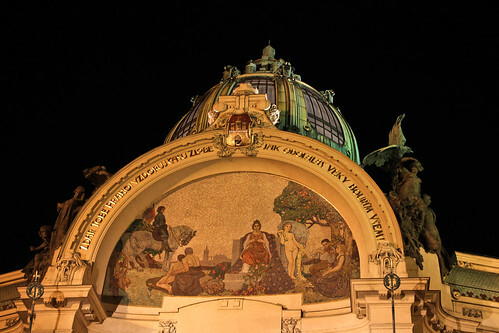 The mosaic in the dome over the entrance (above) is the Apotheosis of Prague, based on a painting by Karel Spillar. 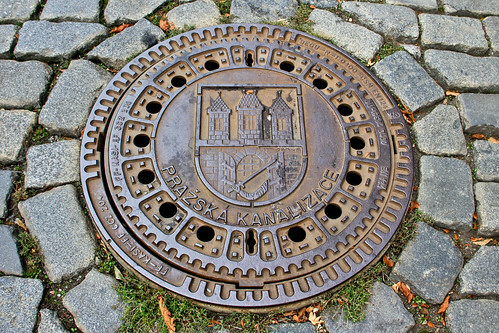 The inscription above the mosaic is a quotation by Svatopluk Cech: “Hail to you Prague! Brave the time and malice as you have resisted all the storms throughout the ages” (could use some editing). 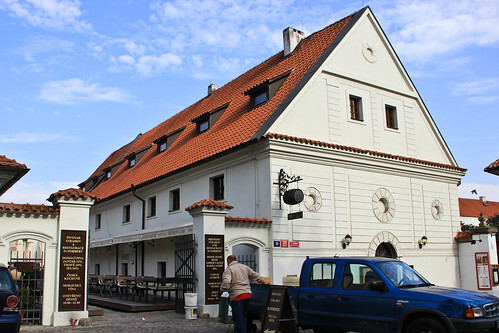 View of the Municipal House with the Powder Tower (one of the 13 original city gates) on the left. 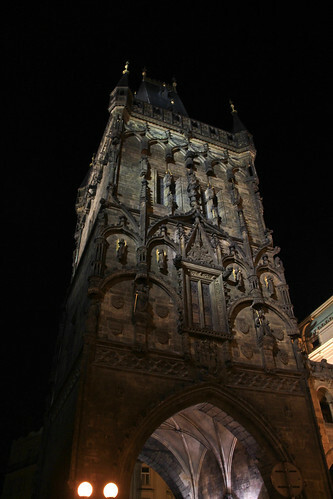 The Powder Tower was started in 1475 and presented to Vladislav II as a coronation gift. 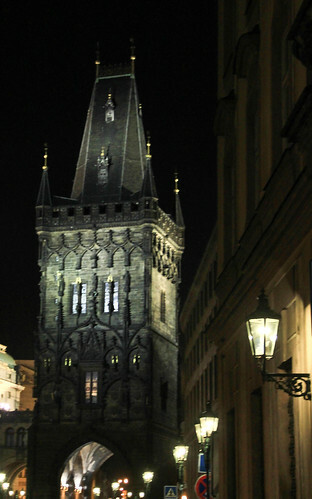 Its design was inspired by Peter Parler’s design of the Charles Bridge. Bridge connecting the Powder Tower and the Municipal House. You can ascend the Powder Tower during the day. I’m told the view is worth the steps, but we climbed so many towers in Prague that we figured we could give this one a miss. Powder Tower from the other side, the side facing the Old Town. 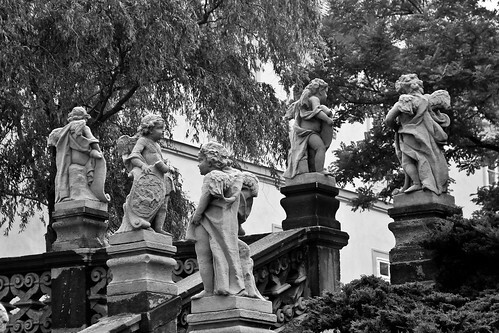 These stone angels outside Loreto Prague, a 16th century cloister, church, and pilgrimage site, look harmless. Until you blink…. At least in the first photo they’re all facing away. 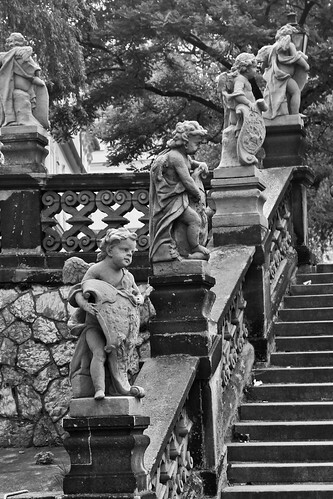 Wasn’t the angel at the bottom of the stairs facing the same direction as the others? 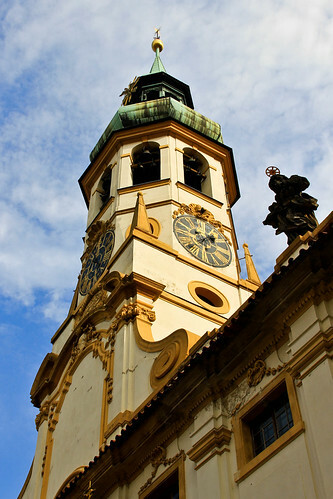 Loreto tower photographed from Loretánská street. 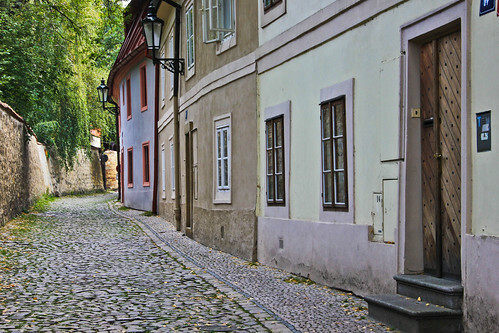 It’s hard to believe that the old part of Prague has some quiet areas. 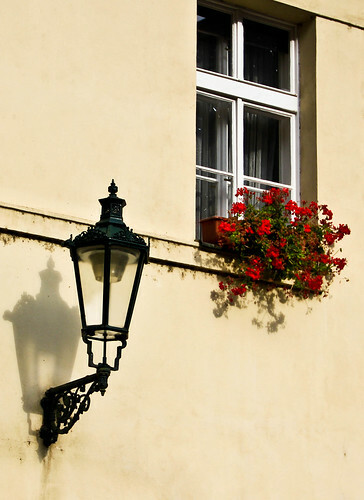 These photos were taken mainly on Černínská street, which is surprisingly quiet, despite its proximity to the palace. 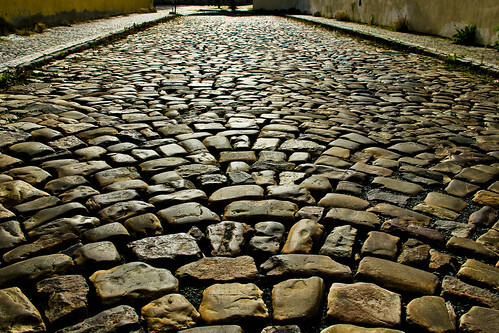 If you’re going to lie down on a cobblestone road to photograph the sun bouncing off the interesting texture of the stones, make sure the road is empty. It also doesn’t hurt to have someone like Ivan along to keep an eye open for cars. These old houses on Nový Svět are still private homes. I have no idea how they manage the small doorways. Czechs tend to be rather tall; here’s a photo of Ivan for comparison. 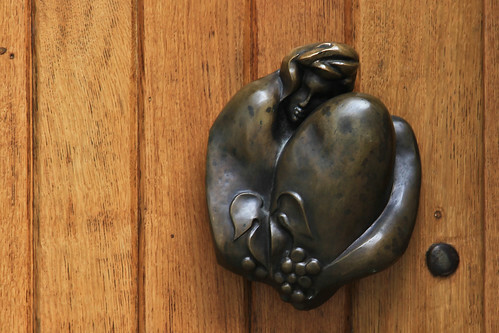 I could fit comfortably under the door, but I’m only 5′ tall. 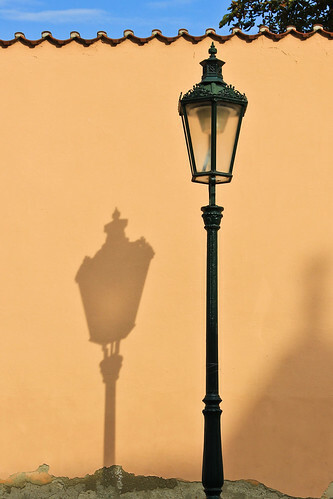 Lamp in front of orange wall on Loretánská. Second-storey balcony at the bottom of Černínská. 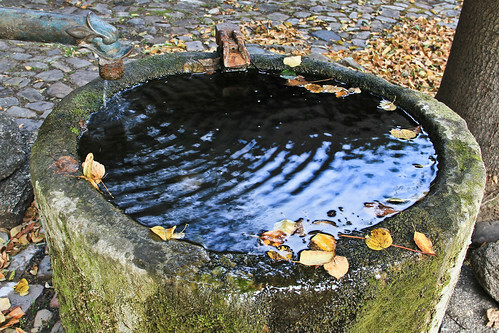 Stone water basin outside the Romantik Hotel U raka. It was September and the leaves were starting to turn. 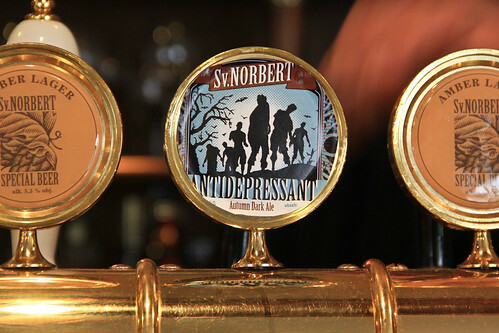 St. Norbert Antidepressant Autumn Dark Ale sounds like a great way to get through the dark cold winter! 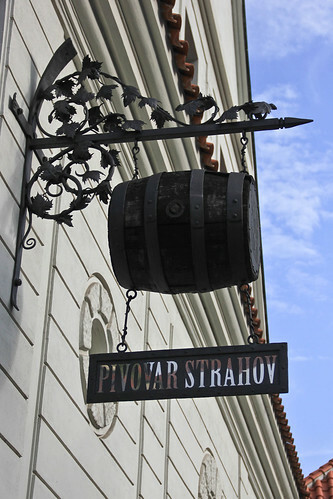 Strahov Monastery has had its own brewery as far back as the 13th century. 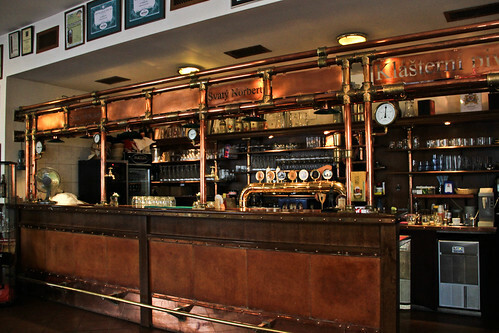 The current brewery buildings date from the 19th century. 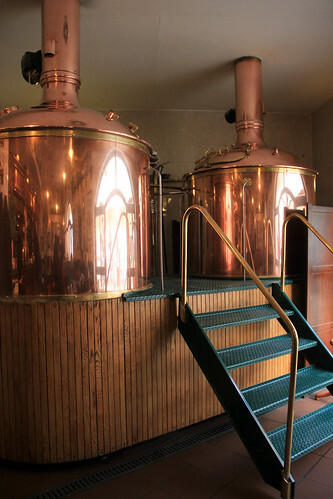 The brewery was closed in 1901 and used for farm equipment. 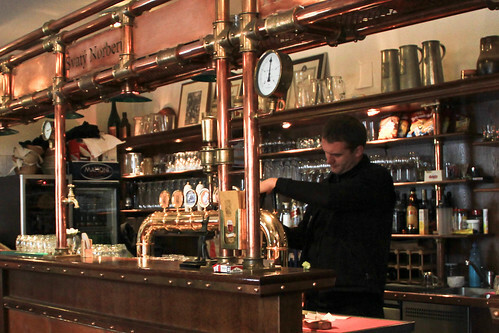 It was re-opened in 2000 and serves food and many different kinds of beer. The tall guy standing in front of the bar is Ivan Navratil, a Czech photo guide (he’s holding a tiny Sony mirror-less camera). 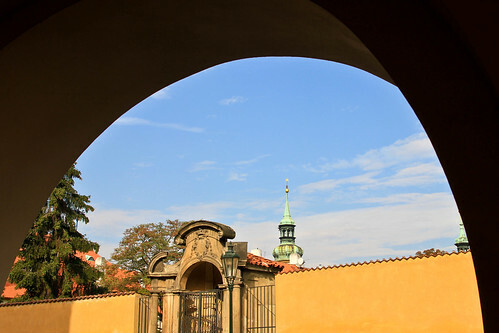 If you’re an avid photographer, I highly recommend Prague Photo Tours. 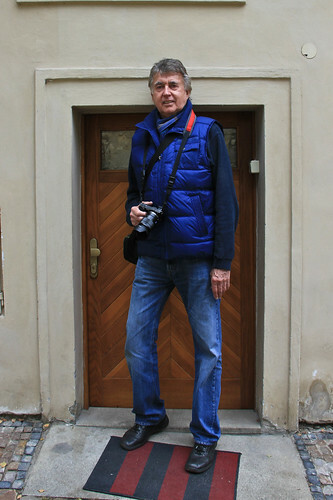 Ivan is a retired photographer who works with Randy Harris, who organizes photo tours in seven cities around the world. 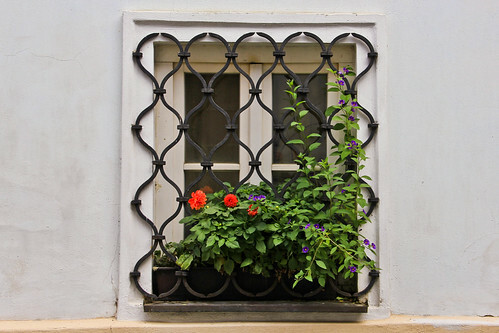 I was the only one on this tour, so we spent 5 hours roaming Prague, photographing a variety of sites, from the regular tourist sites to houses, gates, flowers, architectural details. 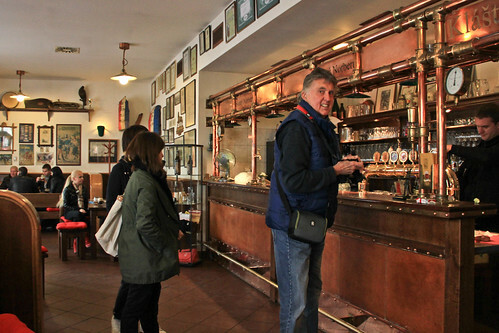 Ivan is friendly, gregarious, and knowledgeable (see his Tripadvisor reviews). If you’re doing a night tour, you can arrange to borrow a tripod, instead of shlepping one in your luggage. There are advantages to booking a local photographer. If you want to get a particular shot (like the famous image of all the bridges aligned), he can tell you how to do it. You have someone keeping an eye on things while you’re busy with your camera equipment. It’s a good idea to think in advance about the kind of shots you want, because otherwise you run the risk of going through a shopping list of shots that everyone else has done. 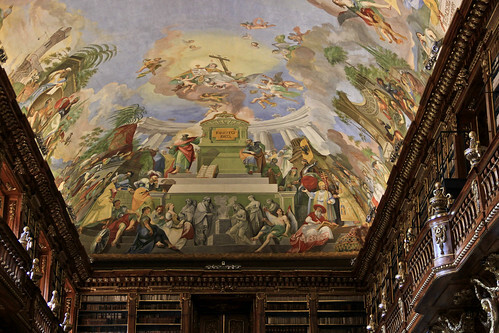 The Theological Hall was built in the late 1600s by an architect of Italian origin, which explains the Italian Baroque stucco cartouches in the ceiling. 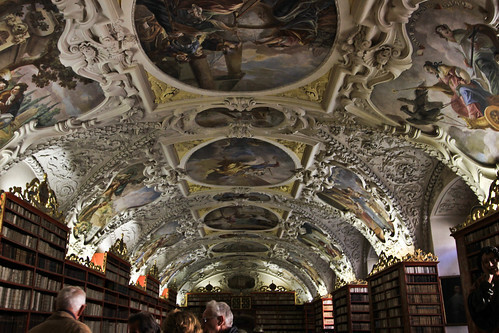 The ceiling frescoes were added in 1727. 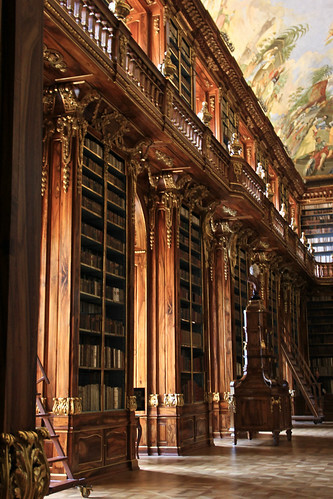 The library contains some 18,000 volumes, mainly theological works. 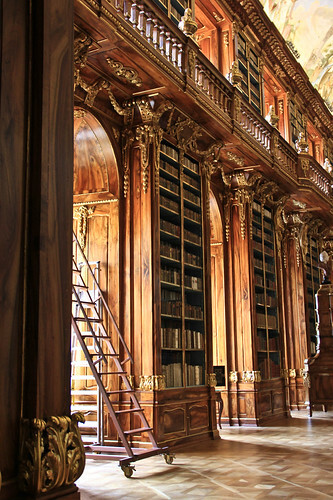 The connecting hall outside the libraries houses a Cabinet of Curiosities and illuminated manuscripts. 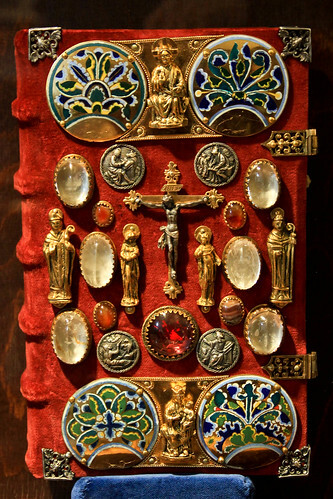 Strahov Evangeliary (9th century), from Trier. 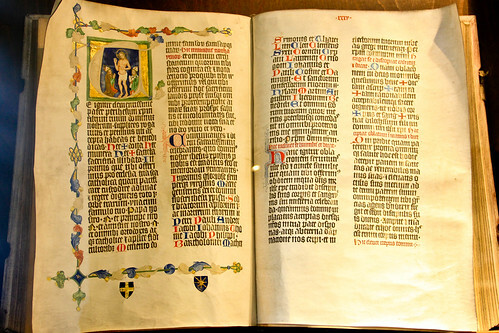 The cover and binding date from the 15th century. You can buy a facsimile for €14,000 (listed on Amazon for $18,000, which does not include shipping). 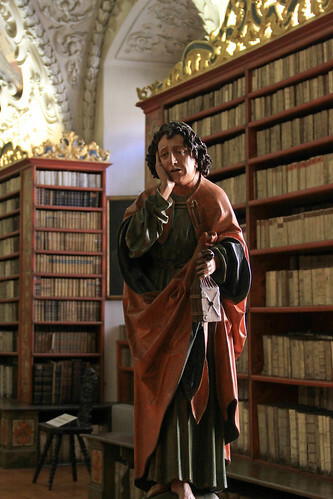 Albert of Sternberk’s Pontifical (1376). As a jigsaw puzzle it is priced very reasonably at $24.99. 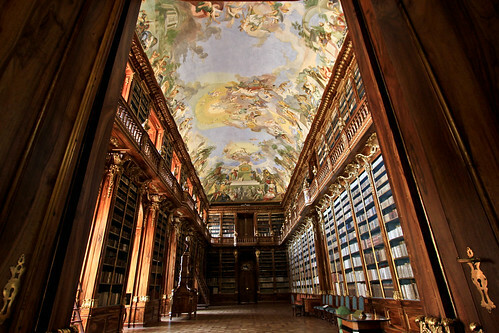 Strahov Monastery’s Philosophical Hall (interior constructed 1794-1797) is probably Prague’s most famous library. If you don’t book a special guided tour, you can only photograph it from the doorway, as I did. A “photo license” costs 30 crowns. You wear a sticker to show that you paid for the privilege. Then you lie on the floor, with tourists walking over you, to try to get a shot of the ceiling. 🙂 I was lucky that it wasn’t too crowded on a Sunday morning.